Dave's BERNINA is Combining with 93.7 Sky FM to give away a new BERNINA! Click here to go to our Facebook Page for a chance to win! Good LUCK! 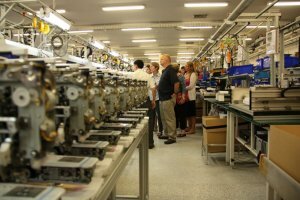 I was very excited to visit the Factory in Thailand in January. 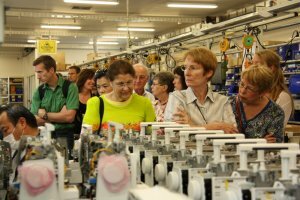 It was an incredible experience to see the process that goes into manufacturing a BERNINA. Actually I have witnessed it before but only in Switzerland, (3 times). 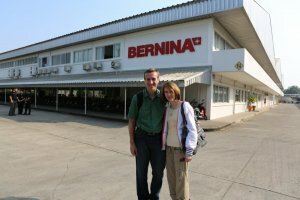 I have to say that after visiting Thailand I am more confident than ever in BERNINA and there manufacturing quality in both Factory locations. The factory in imaculate and the workers do an incredible job. 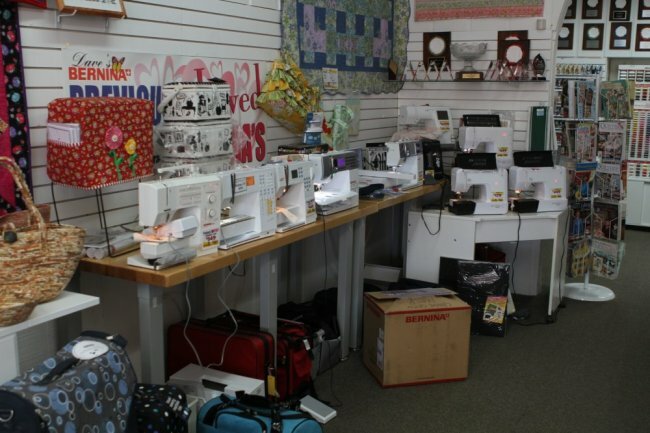 Dave’s Bernina is offering several fun classes and workshops during the month of February, so you can sharpen your sewing and craft skills. Here is a list of just a few of the events we’re hosting in February. Come learn how to sew a super cute sewing organizer with us. You can pick out a fabric you like, and we’ll show you have to use creative stitching to make a bag you’ll want to take with you everywhere. *Thursday February 7 from 6:30 pm-8:30 pm AND Friday February 8 from 10:30 am-12:30 pm. Come make beautifully decorated heart-themed cards to give to that special someone. Join us in this workshop to turn a regular zip-up hoodie into a fun and unique argyle sweatshirt. Do you struggle to keep things organized in your own personal space? Well then this workshop is for you. 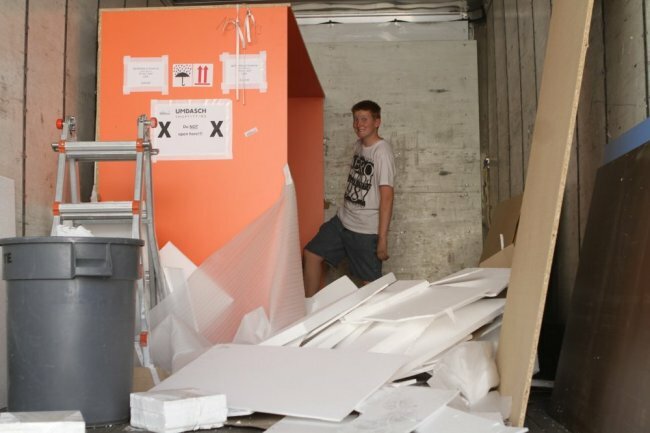 Come make two “Fused and Folded Boxes” with us and get help with getting organized. Come to this workshop to learn how to use the rolled hem feature on your serger by making a cute ruffle scarf. Only person can use the machine at the time. Keep your fingers away from the needle. Don’t be talking to someone or distract yourself in any way from the task at hand. Ladies keep your hair tied back. Men must not wear ties. Have them sign the legal document. Make a few copies. Frame one, give one to them and hide the original somewhere they can’t find and rip it up. It’s important you keep the evidence. The punishments should be light and fun, and yet slightly annoying. Not enough to make them mad, but just enough to tease them. These will have to be cleverly thought up by the giver of the gift. Be sure to make them fun, otherwise they will begin to resent you or the gift. The punishment can be something as simple as tickling if they are a family member, or even a free back massage. Be careful about not pushing buttons, keep it light and friendly. They will break the rules, there’s no question about that. This way they will still know you’re worried about them, and you have a fun way to show your concern. Christmas is coming up quickly! Along with the gift giving and the partaking of great meals, many of us cherish being able to share Christmas traditions with others and to pass them down to our children. For some people, Christmas traditions involve volunteering, or giving pajamas, or perhaps traveling to certain locations. One of the best Christmas traditions of all is sharing the gift of sewing or quilting with daughters and granddaughter around the holidays. When you sit down with loved ones and teach them about sewing and quilting, you are doing far more than just following traditions. This is precious time where you can talk about life as well as teaching a skill that will last for their entire lives. Having someone spend some time this holiday season teaching these skills makes for great memories. Whether your daughters and granddaughters are new to sewing and quilting or they have a lot of experience, you can always enjoy the teaching moment. In fact, they might be able to teach you something new! A sewing or quilting tradition is great for the holidays. You can work on projects that are gifted to others, or perhaps complete a family memento that will remind you of the love you have for each other. Anytime is a great time to start a holiday project with your family! Traditions are about building memories and building great bonds between loved ones. With sewing and quilting, you can pass something useful and fun on to others and make the holiday season even better! Visit Us at the Christmas Gift Festival! We are proud and excited to be participating in the upcoming Christmas Gift Festival this year! For a combined total of 6 days, we will be having a blast at University Mall, where Nordstrom used to be. For the next two weeks, this festival will be occurring at the mall on Fridays, Saturdays, and Mondays. The Christmas Gift Festival is a way for Utah Residents to celebrate the holiday season with each other and with local retailers while supporting a good cause. During the Gift Festival, there will be vendors of all sorts in attendance, as well as lots of gift options and ideas for you to choose from. One of the major focuses of this festival are the exciting charity events such as the Gingerbread House Festival and the Utah Valley Charity Trees. These are excellent causes which have helped out thousands and thousands of people, so they are worth checking out! Make sure to bring your friends, your family, and yourself! It should be a good time for all age groups, and there are going to be featured children’s’ activities in order to get the kids pumped up for the holidays! We hope to see you there! As an important not, we are giving away a brand new machine in tandem with our festival participation. One lucky person can win a brand new Bernette 46 on company FB page. Visit us on Facebook and “”like” our page for your chance to win! Visit the Christmas Gift Festival on Facebook! Join Us at the Harvest Retreat! Hey everyone! We’re coming up on our Harvest Retreat, and based on experience from years past, we’re going to have a great time! We’d just like to take a minute to remind everyone about what we have to going on, and that there is going to be something there for everyone. You can register online for the Harvest Retreat at our website, or call with any questions you might have. The Harvest Festival is going on from Sep 26-29. We’re going to have a lot of classes and presentations that you can register for, so sign up for what you want. We’re glad to have you! 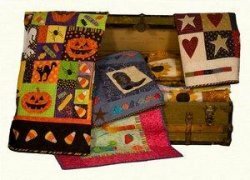 Wednesday September 26th- Special guest Angie Steveson of Lunch Box Quilts will be doing a special Trunk show from 6:00 PM- 8:00 PM. Thursday September 27th- Angie is going to be doing an all-day seminar from 9:30 AM- 4:00 PM. You can attend this seminar for $60. Register online at our website! Friday September 28th. Classes will run from 9:00 AM- 12:30 PM in the morning, followed by classes in the afternoon from 2:00 PM to 5:00 PM. Evening classes will go from 6:30 PM- 9:30 PM. Saturday September 29th. Morning classes will go from 9:30 AM-12:30 PM, followed by afternoon classes running from 2:00 PM- 5:00 PM. Please note- we are having a huge discount on supplies for those who sign up for classes. We want to make sure that you are prepared and ready to have a great time, so please purchase everything you need at a discount- with our compliments. We hope to see you all there. Have a great weekend! Hey everyone! We’d just like to take a quick minute to talk about one of our great deals we have going on right now. If you have a machine that needs a tune-up, bring it in and we’ll get you a special price for it. We’re offering a $60 tune-up for $45. That’s a discount of 25 percent! Tell your friends about it- this is a great time to have machines serviced. You can buy this deal now, share it with friends, or buy and share alike! This deal is available in both our St. George and Provo locations. The Coupon Fine Print: Coupon valid from 9/1/2012 to 11/30/2012. Limit 2 per person, and one coupon per visit. Can't be combined with other offers. Coupon must be presented at the time a machine is left for Service. Does not apply to prior services. As another note- our remodel in Provo is done! We’re pretty pleased with the way it turned out. Be sure to stop by and check out our improved space! We’re uploading pictures of the remodel. It was a bit of a process, but it was worth it! What Kind of Warranty Comes with Your BERNINA? Are you looking to buy a BERNINA at one of our stores but want to know more about our warranties? If so, look no further. 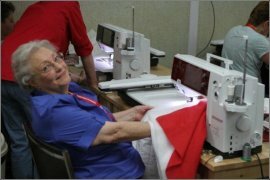 BERNINA offers great warranties on its products that are meant to ensure that the customer is taken care of for a long time. - Factory Warrant from BERNINA of America covers defective parts for 20 years from date of purchase. - 1 year labor/service warranty. - Computerized machines are covered by a 5 year warranty for all circuit boards. - 2 year warranty on all electronic parts. Exclusive to our stores in Provo and St. George, Dave’s BERNINA includes an additional 4 year extended warranty when buying a new machine, as well as a host of other perks, including free classes and club memberships with us, as well as future discounts and upgrades. We treat our customers right! 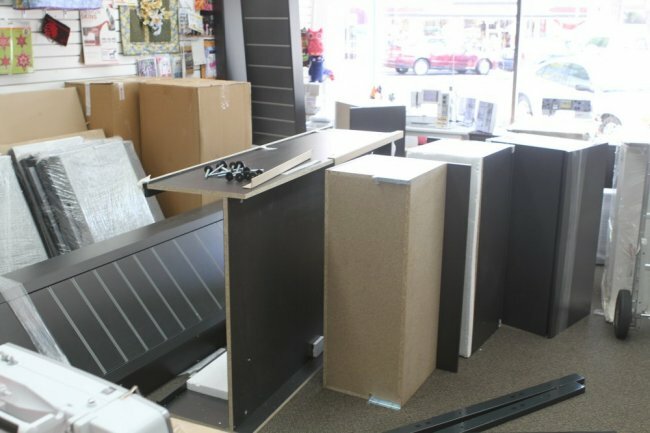 Please note: We cannot offer warranties on BERNINAs bought online. 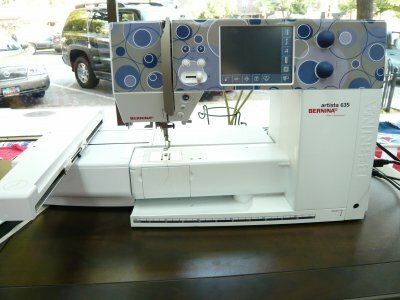 Any BERNINA you buy at a store will come with a warranty, but getting one from an individual who is selling you theirs does not allow you to qualify for warranty conditions. 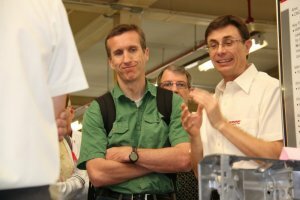 Bernina is committed to quality, and cannot ensure the condition of the equipment you buy from others online. As such, you cannot get a BERNINA from an official source over the Internet. Please visit our stores to qualify for a great warranty when you purchase a machine- we offer them for both new and used. We’re glad to help! 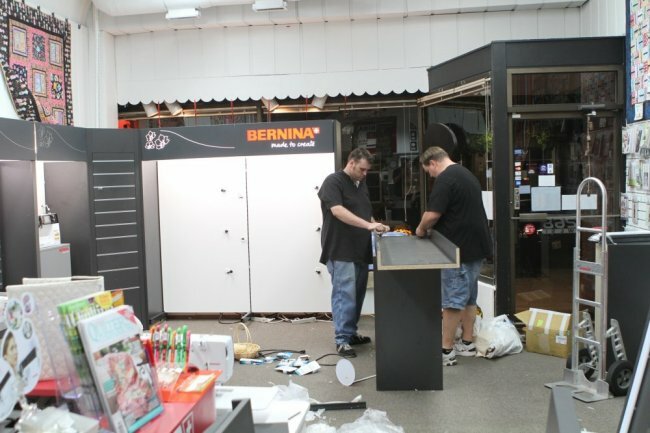 Dave’s Bernina Grand Re-Opening this Week! Dave’s Bernina is re-opening its doors today to welcome bake long-time friends and greet first-time visitors. We have a new look after months of renovations and are ready to show the public what we’ve got going under the hood. We invite you to celebrate our re-opening with us. Drop by our local store and take advantage of our door prizes, sales and demos. Today, we are offering 48 month no interest financing. You can also walk away with screaming deals on our accessories. They are all 25% off today! You can receive up to $2,000 off the Bernina 730E or Bernina 635LE, making these machines more affordable than they have ever been before. 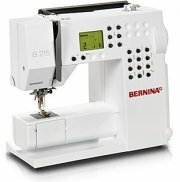 The classic Bernina 46 is priced at only $199. Many of our loyal customers began with this machine. They found they loved it and have come back again and again for all of their sewing machine needs. This machine is still as relevant to today’s sewing needs as it was when it was made. We at Dave’s Bernina are proudly showcasing our newest prize—the all new Bernina 780E. This machine is the apple of our eye. It is the newest in our line of superb sewing machines. Today, it is available for the first time for the general public to try out for themselves. If you like what you see, pre-order it and be the first to enjoy its awesome features in your home. 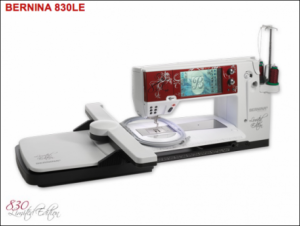 Be sure to try your hand at winning the free Bernina 380. Enter into the drawing and you may be the lucky winner who walks home with a new Bernina. Hi everyone! We’ve got an exciting upcoming event that we would like to focus on today! Angie Stevenson is going to be doing two workshops next month: one on September 26th and one on September 27th. Angie is going to be doing an evening trunk show on September 26th, from 6-8 PM. On the 27th, she’s going to hold a special sit-and-sew workshop on embroidery machine appliqué, from 9:30am to 4:00 PM. During this 6 hour workshop, you will learn how to master applique on your embroidery machine, no matter what. This class is going to focus on improving skills and mastering techniques. We’ll be doing Lunchbox Quilting, so you’ll get to pick your own from a selection of 13 patterns. Save the dates and bring a friend! Angie is great at what she does, and this should be a great experience for everyone. Quick reminder- We’d like to remind everyone that the dates for Camp Sew Fun have been moved from August 7-9 to August 8-10. Check your schedules to be sure you can still make it! As our last announcement, we’re going to have an unveiling for the new 780 machine in our stores on August 9th and 10th. St. George will have it on the 9th, while Provo gets it on the 10th. It is going to be at each store for only one day before we ship it back to corporate! Sign up for the unveiling at 11 AM, and come check out our used 730 and 635 machines- we’re going to have a great deal coming up! These coming months are going to be great, so we hope to see you soon! Dave's Bernina's Summer of Fun! Hi everyone! We’ve got a great schedule lined up for summer in our Provo and St. George locations! We’re looking forward to having a lot of fun! As always we love to see new faces at classes and encourage everyone to bring friends, and we’re just as excited to see old friends come back. August 8th- Could It Be Vera? August 16th- If You Can’t Stand the Heat… Make a Potholder! Sign up today for the ones that sound interesting to you! We hope to see you all in class! 830 Retreat at Dave's Bernina! Looking to improve on your quilting and embroidery skills? Wanting a change of pace? Or maybe just looking to have fun with other likeminded people? Sign up for our 830 retreat today! Our 830 retreat is going from Friday July 27 to Saturday July 28. 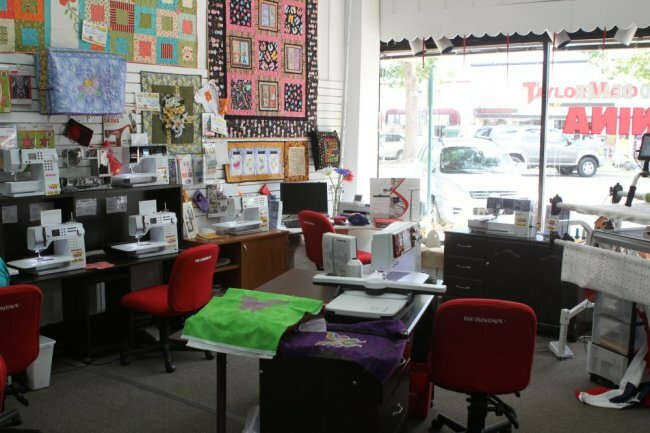 We’ve got a great section of classes to choose from, with a big focus on embroidery and quilting. These classes will focus on our 830 machine and its ability to do a wide range of complex work effortlessly. We’ll not only be going over all of the best ways to utilize the abilities of your 830, but we’ll also be showing some of the most effective techniques that will leave you with beautiful results. 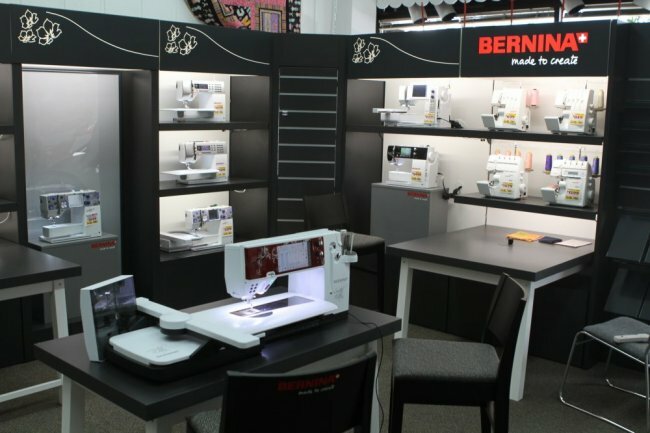 In addition, we’ll be showcasing some of our newest Bernina products, so that you have the option to update your equipment if you need to. All in all, it’s looking like it will be a fun time that is also very helpful to 830 users and those who simply are wanting to improve their skill sets even more. 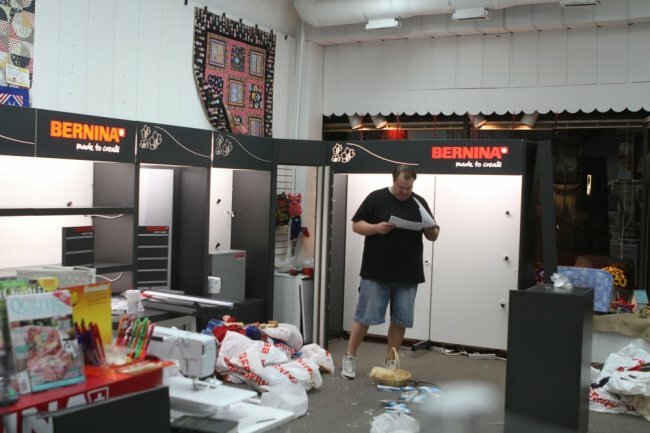 Bernina events are known for their quality, so this is one that you don’t want to miss! No matter how much you use it, your sewing machine is a tool that is helping you to do a job. Just like any other tool, your sewing machine needs to be maintained and cleaned on a regular basis in order to keep it running at peak effectiveness. You can do most of the maintenance work yourself- and it doesn’t take long at all! 1- Service your machine annually. 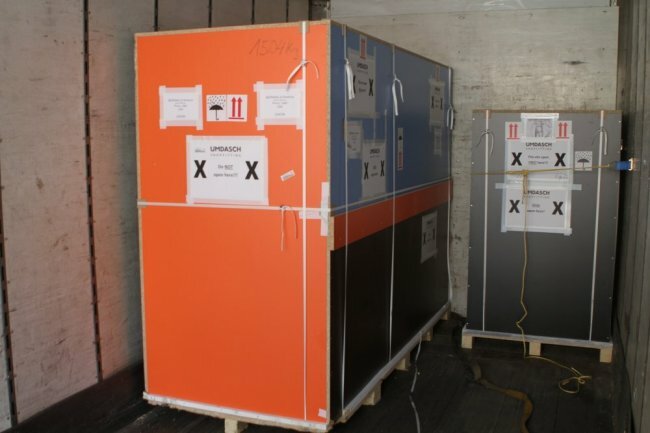 This means thoroughly going through and making sure that it is clean and in good operation. Some disassembly is required, which is why you will need your instruction manual! 2- Conduct mini tune-ups yourself throughout the year. 3- Use cans of compressed air to give yourself a quick and effective way to remove dust and list from the nooks and crannies of your machine. 4- Use a small lint brush (or a makeup brush as an alternative) to gently brush away list and dust that has accumulated or stuck. 5- Make sure that you clean the lint out of the feed dogs regularly. 6- Make sure to consult your instruction manual before you oil any part of your machine. Some modern options do not need it. Should you need to oil your machine, a single drop on the moving parts will do-- so do not overdo it. 7- Always swap in a fresh needle when starting a new project, or anytime that the needle gets damaged. 8- Make sure to cover your machine when it is not in use! 9- Last of all, make sure that you store your sewing machine in a cool dry place when you are not using it, so that it will remain in optimal shape for you. Your sewing machine will be able to perform better if you take care of it on a regular basis. You can think of it this way: Take care of your sewing machine, and it will take care of you! 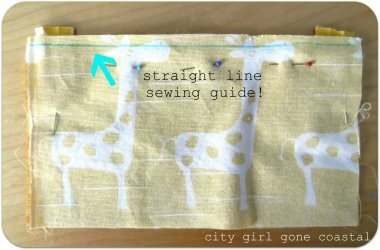 Today we’re going to be talking about one of the core basics of sewing- sewing a perfectly straight line. It is something that we all have to learn as we take up the hobby, and it is always good to be refreshed. There are two big factors that influence the lines you get: pedal control and your ability to keep consistent lines. When you are working with your sewing machine, keep consistent pressure on the pedal, and use it in gradual increments. Go at your own pace and adjust based on what is happening, but never cut off or push down hard without easing into it. This will help you avoid snags and having your fingers get in the way! The lines on the plate under the needle of your machine are your best friend when it comes to sewing straight lines. There are several lines next to each other on these plates, which are evenly spaced out. You can use these to know exactly how straight you are sewing, as well as being able to keep your pleats consistent the whole time. So, apply steady pressure, go at your own rate, and keep an eye on those parallel lines that you have! You’ll get much more consistent and straight results this way. Just remember that if you make a mistake it is perfectly normal! Even the pros make mistakes of the basics every now and then. The key is to never get discouraged, and to always take every mistake as a lesson. And after the lesson has been learned, there is always picking! Getting it perfect every time is going to take practice and muscle memory. The great thing is that you can develop these skills as you go without having to focus on them to much- because the more projects that you do, the more the skills will develop over time! One of the truths that we all find out the longer that we all sew is that no matter how experienced or skilled you are at sewing- you’ll still have to unpick! Experienced people make mistakes just like the new people do, so they have to unpick just the same. 1- First, get a good seam ripper! This little tool is invaluable! You want one that is both durable and very sharp. You want to be able to cut through threads with a minimum of effort. 2- Next, cut through a few of the threads in your line, then pull the threads out. You don’t have to slice through every single stitch! 3- Be gentle and use the seam ripper to carefully push through stitches, you never want to hit your fabric with it! 4- Last of all, use a lint roller or sticky tape to clean up the loose threads and fluff. It’s a lot easier than using your hands! Unpicking is a part of the sewing experience. We all have to do it, so we might as well do it with a smile! Hopefully these tips allow some of our readers to get through unpicking quickly, so that the rest of the project can go on! 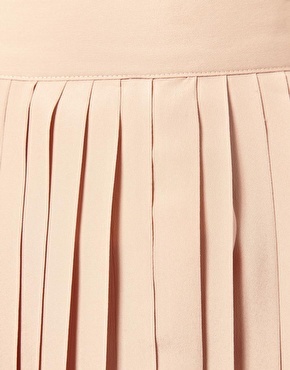 Pleats are a popular garment detail which adds some visual flair and style to the piece that you are working on. These fabric folds make the skirt more vibrant, whether they are running for the length of the skirt of or are just on the low hemline edge. -When marking your pleats, use scissors to snip- mark the pleat lines in the seam allowance. -Use straight pins to mark the remainder of each pleat line. -Crease fabric along the solid line, press lightly, and remove the pins. Bring the pressed edge to meet the broken line and pin in place. -Cut a strip of brown paper bag, inserting it between the garment and the unbasted fold of each pleat as you press. Press away! -Topstitching and edging are used to hold your pleats in place. On a skirt, it usually begins at the waist and extends down to the hip area, through all the layers. -To give topstitching and edging the look of one continuous line, do the edgestiching first, stitching below the hipline. Then go over it again and edgestitch to finish up. -Clip the seam allowance to the line of stitching at the top of the hem allowance. -Press the seams open below the clip and trim them. -Finish the raw edge of the hem allowance. Hem the garment. -Re-press the lower edges of the pleats. By following these tips, you should be able to get pleats that look great and add fun and movement to your skirts. Above all else, have fun and figure out what works best for you! Dave’s Bernina is having a one day only sale tomorrow! 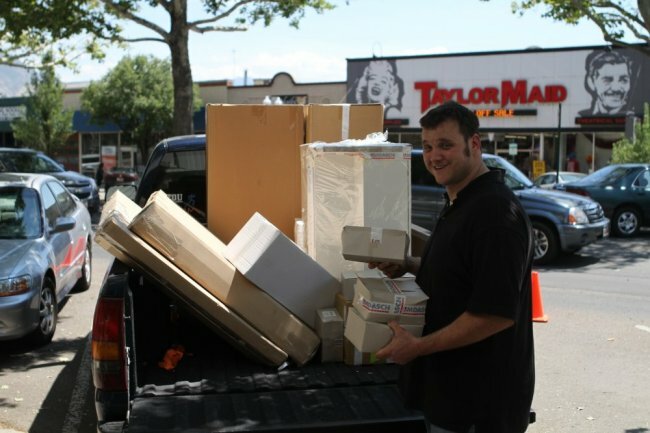 On June 16th, we will be having a huge sale on all of our machines! We’re offering a lot of great perks with this sale that you’re not going to want to miss! We’re going to be offering 48 months of interest free financing for our machines priced to sell. Of particular note in this sale is the 830LE! Along with the 830LE, we are including a free Jumbo Hoop, and a $500 dollar mail in certificate which can be used on anything in the store. We’re not limited to the 830LE, however. Everything is going to be on sale! Notions, Feet, Accessories, Patterns, and everything else will be on sale- up to 50% off! Tell your friends and get in here! Whether you’re looking for a machine or you want to build up your supplies, there is going to be something for you! This is only going on tomorrow, so spread the word! We are proud to be participating in the Quilt Walk in Panguitch this year! There is going to be a lot of fun events to go to, and a lot to be learned about sewing and quilting as well. We invite anyone who wants to learn some new skills to come participate with us! For those of you who are unfamiliar with the Quilt Walk, it is an annual event which is held in order to celebrate the founding and history of Panguitch. For 12 years now, the city has hosted this gathering of quilting enthusiast, as well as those who are just looking to have a great time. The Quilt Walk celebrates that history with classes, games, reenactments, and food. It’s a great activity to bring the family to! The quilt walk takes place June 7-9 this year. See you there! For more information about the quilt walk, active registration, and the activities going on during it, please visit http://www.quiltwalk.org/. And be sure to come say hi at our booth. We’d love to see you there! 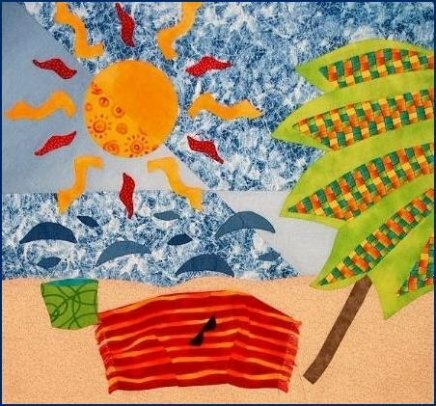 Camp Sew Fun Classes for Some Summer Fun! “Let’s Shop” on June 4th, 5th and 7th. This is a camp designed for beginners ages 8 and older. The camp will go from 10:30am-2:00pm each day and the cost of the camp is $95.00, which will include a kit. “Let’s Bake” on July 16th, 17th and 20th. This is a class that has been designed for kids with some experience that are 8 or older. The camp will also go from 10:30am-2:00pm. The cost of this camp is $122 and includes a kit. “Turning Twenty Quilt” on July 21st, August 2nd and 3rd. Experience is required for this class. The camp will go from 10:30am-3:00pm each day and the cost of this camp is $158, which includes a kit. This camp will give your children the opportunity to learn skills that they can use for the rest of their life. It is a great way to let your children have fun this summer without worrying about them. Stop by our store or check out our class schedule if you’d like to know more! Attention quilters! We are hosting a contest through the Daily Herald which we think should be really fun. We’ve decided to offer a prize for the winners that we know a lot of you will like. As the prize for winning, we are going to give away an AcuQulit GO! Baby Fabric Cutter. For those of you who are unfamiliar with this product, the AcuQuilt allows you to make precise cuts into your fabric without having to worry about straining yourself. This fabric cutter is great because not only is it designed and built with the quilter in mind, but it also will be able to make a difference right off the bat! The equipment does not need a power cord or batteries, and is designed to be compact and foldable so that you can easily carry it around and store it! It is perfect for those who either require a lot of accuracy, or who maybe are having trouble cutting fabric by hand. The quality of the blades which are inset into the AcuQuilt will give you a lifetime of accurate precision, and will not dull as long as they are used for fabric cutting. 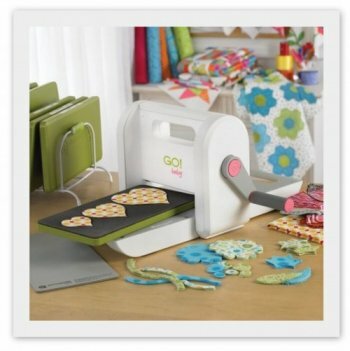 Your projects should be even more enjoyable and should be made easier if you use this fabric cutter while you work! If you would like to participate and compete for this awesome prize then check the Daily Herald for our ad! Information about entry and the rules of the contest can be found in there. We hope to see a lot of great submissions! Have fun, everyone! 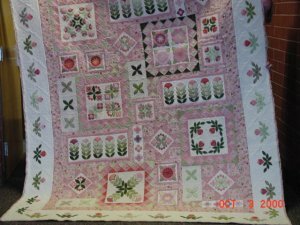 If you are at loss as to what you can give your mother this mother’s day, a travelling quilt may be the answer that you have been looking for. If you and your mother share the skill of quilting, this can be a great way to spend quality time together and enjoy each other’s creativity. If you and your mother do not know how to quilt, you can take classes! If only one of you knows how to quilt, it is a great opportunity for one to learn from the other. A travelling quilt will require each of you to make blocks for the quilt. As you finish the blocks you can send the quilt back and forth to one another. When you live close to each other, you may even plan to spend a specific amount of time quilting with each other once a month. If you do not live close enough to be able to quilt together, you can simply send the quilt back and forth to each other. Building off of the creativity of the last block is a great way to get to know each other better and see the creative nature of someone you hold dear. Include a nice note about how much you love her and you can bet your gift will be a success. There are many different sewing techniques that are difficult to master. Sometimes though, there are some simple tricks that can help seamstresses successfully accomplish these difficult to master techniques. Stick a tack through the material and hold the tack in place with some transparent tape. Make sure that the sharp end is sticking out of the material. Lay the material on the sewing machine. Sew a circle with an equal radius around the tack. Mark the desired length of your hem and then trim your fabric to be about one inch longer than the finished length. Fold the excess fabric to the wrong side and then press, fold and pin the fabric to hold it. Put your sewing machine on a zigzag stitch or even on a satin stitch setting. Once everything is set up you will then want to start stitching. As you are stitching you need to stretch the hem. The more that you stretch the wavier edge you will have. As you stretch you need to keep the material evenly stretched. While you are stretching the fabric you need to stitch over the folded edge. Once you finished stitching turn to the wrong side of the hem and trim the extra fabric. Do not be afraid if the hem is stretched and distorted, it will need time to recover. As the material rests your lettuce edge will start to reveal itself. 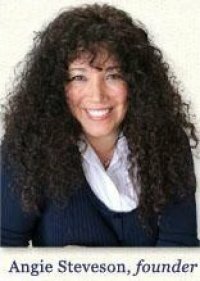 If you are overwhelmed by either of these techniques, you may want to take a sewing class. A beginning sewing class can be a great way to learn basic techniques that you can use throughout the rest of your sewing adventures. Dave’s Bernina now has a Pinterest! Follow us on Pinterest to see those sewing projects that have inspired us. We will also pin anything beautiful or inspiring that we can find on the internet. As we are out prowling the internet for pins that will spark creativity and inspire project ideas, we want to be able to share them with you. We are also interested in what you have to share. Following our customers and those that find projects that spark creativity is a great way for us to broaden our horizons in the sewing world. If you have not discovered Pinterest yet, you may want to stop by their website. Pinterest is an online Pinboard. This means that you can organize and share all of the beautiful and inspiring pictures and web pages that you find on the internet. Anything that you find can be pinned onto your own pinboard. When you find someone interesting on the internet, you simply have to pin it onto your pin board. You can create many different pinbords to organize the ideas and inspirational items that you find while you are browsing the internet. So, if you aren’t a part of the Pinterest community yet, hop on board! If you are part of the community, find Dave’s Bernina, follow us and let us take part in your virtual pinning experience! There are many ways that sewing can improve your life. Although you may only think of sewing as a hobby, there can be real benefits to dusting off your sewing machine and starting a new project. Sewing can be a great way to save money. When you start sewing you can learn how to make clothes for yourself, accessories for your home or even make gifts to give to others. Often times, you are able to save a lot of money when you can make something on your own. To ensure that your sewing is financially beneficial you can start looking for good deals on material or shopping through the sales sections of your local craft store. Sewing is a great creative outlet. When you sit behind a desk eight hours a day or even if you are home with your children all day, you may need some time to be able to express yourself creatively. Sewing can be a great way to express yourself creatively and ensure that you are receiving the fulfillment that comes from this expression. Sewing can be a great stress reliever. When you are able to express yourself through your sewing and safe money with your projects you may find that your sewing is a great way to unwind and relieve some of your stress. When you find sewing to be a stress reliever you can eliminate less beneficial habits that previously helped you relieve your stress. The time may arise when you either want to fix faded clothing by inserting color in it, or you want to give them a new color altogether. This process can easily be done at home, with the right supplies. As such, there are many different ways that you can touch up or alter your clothes for a reduced price! Here are some helpful tips for when you decide to dye your own clothes at home. Have fun, be safe, and wear them with pride! Ventilation. First of all, make sure that your work space is well ventilated. Dyes can give off powerful fumes which may be harmful if they are contained in a small area. Open up some doors or windows to get off to the best start. Rubber Gloves. Always make sure that you protect and cover your hands. While most dyes are fairly harmless when they come in contact with the skin, they will stain it quite severaly. It is better to be safe than sorry. Natural Fibers. As an important aside, natural fibers are able to be dyed much more effectively than synthetic ones. This can help you narrow down what you would like to work on, in order to get the best results. Remove color. Another important tips involves removing as much color as possible from the clothing using an approved color remover treatment. This will give the process more of an effective base to work with. Do one color at a time. Last of all, we recommend doing one color at a time if you are working with multiple colors. Giving color the time to dry is the best way to ensure that things to not run or clump or stain poorly. By dyeing your own clothes at home, you have the option to either fix a color situation, or come up with something innovative and unique to you. Your creations will always be special because you worked on them, so every piece is an adventure which is waiting to happen! A way to sign up for sewing classes online. To ensure that joining our classes is as easy as possible you can sign up for a class that you want to take on the internet. You will be able to browse through the classes and make your reservation without ever even having to leave your home. Our online calendar and schedules will also be available online. You will be able to look through our calendar and schedules so that you can be sure that you find activities that you are interested in that fit into your schedule. An easy way to register for our newsletter will ensure that you are going to be able to keep up to date with everything that is going on in stores. With the newsletter you will know everything that is happening in your local store. Easy access to our blog will also help you stay up to date with new and innovative sewing ideas and tips. Visit our new website today so you can take advantage of all of these wonderful new features. Look around and be sure to let us know if you have any questions about using the site. Looking for a way to spice up the holidays with a little sewing? If so, then try making your own gift wrap this holiday season. It’s a great project, and it’s easy and fun! Making your own gift wrap says to the recipient of the gift that you care about them, and that you put the time and effort into the covering that they are removing, not to mention the gist itself. This is such a great way to warp gifts because of the ease and variability of the action. Indeed, if you are feeling crafty, you can of course fabricate your own wrapping from scratch. But, if you’re not feeling like doing everything, there are a lot of shortcuts that you can take in order to get the same effect. The point of wrapping your gifts this ways is to create something that is fun and cute and memorable, not to mention enjoyable for you. Reusable gift wrap can also be a gift in itself, if the person who is getting the gift wants to hang onto it. While those of you who are feeling extra crafty can make your covers for presents based on the exact specifications of the gift, here’s a handy starting point for the rest of us. 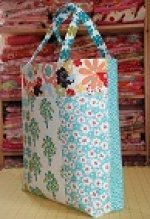 Taking a reusable shopping bag or tote and decorating it is one of the best ways to create your own gift wrap, and it’s easy to do. All you have to do is sew designs into it and make it feel festive, and embellish from there! From this simple starting point, you can keep working until you have a project that is truly unique and beautiful. Dave’s Bernina Tip of the Week! Tip of the week: Sorry I missed a few weeks it has been busy but fun at the store. The Christmas sewing is coming along but it is hard to get some of it done without everyone seeing it. So I mix another project in with it. The PJ pieces are sitting there with a quilt project that I am working on. That way when one of the kids or husband comes in they see a mix of fabric and think that it is just one of my regular projects. The best way to hide something is in plane sight sometimes. When you start shopping for a sewing kit do not be afraid to talk to a sales assistant in the store. You want to make sure that you take the time that you need to understand how you will get the quality equipment for the right price. Be sure that you organize your kit as well. You want to be able to find everything that you need when you need it. As you are organizing your kit you may also want to make sure that you have somewhere safe to store the kit. Put the kit into the same closet or cupboard so that you always know where it is. This way, you can be sure that you are able to grab your kit and start working on your sewing project whenever you need it. Do you have a lot of UFO’s (UnFinished Projects)? It can seam so overwhelming when you look at them all altogether. Well I have found that when I make a list of them all, then I try to finish a few that only have a small amount left to do, like hem the skirt, put buttons on, or bind a quilt. That way I have that feeling of accomplishment, and I am excited to tackle one of my bigger projects. The nice thing about this is, I can go out and get more fabric without feeling bad about buying more! Fix Up Your Old Clothes Instead of Spending Money on New Ones! If you are starting to notice wear and tear on your clothing, but you do not have enough in the bank to go on a shopping spree, it is time to pull out your Bernina Sewing Machine! There are many things that you can do to spruce up some of your favorite old items, without spending a fortune. Once you have the proper pattern, the rest is some simple sewing. Once your creation is complete, simply attach it exactly where the original was. You can experiment with different colors to see which contrast you like the most, just to spice things up a little. Gone are the days of throwing out shirts at the first sign of a tattered look. 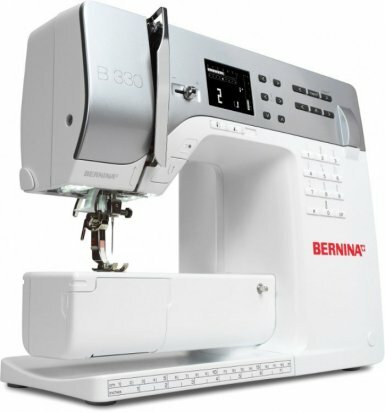 Use your Bernina machine to give your wardrobe a makeover, today!